Is there any way to block interference at the TV? I forget if this has been addressed, but you should look up DTV stations in your area and make sure none have placed their carrier (often different from the virtual channel numbers they identify themselves with) on the channel your modulator is using or an adjacent channel...If that is the case you will be best server to change the channel your modulating on to escape it. *Older brush type motors and switch mode supplies can generate a LOT of harmonics across multiple bands and potentially interfere with every consumer reception device you own. There used to be more young active ham radio operators actively ferreting these noise sources out and stopping them from interfering, but that has become rare. Well, today was the day. After curing for three weeks, I rubbed the cabinet down and reassembled the set. Final reassembly took a few hours. The set is complete now, after two and a half years. Woohoo! I started with an interesting hulk and on a whim decided to see if I could make it work again. With all of your help and advice, I was able to. Thank you all. Videos of the set playing are at https://www.icloud.com/sharedalbum/#B0f5n8hH4m5dr7. One final post - a reminder of the starting point in January 2015. What a trip this has been. it is sets with lots of problems like this one that seperate repair men from the wannabee repair man. congratulations you now are one of the repairmen of the world. very good job on this tv and it came out great. i am sure your grandfather is very proud of you and happy his tv is now not only working good but looks great. anxious to find out what your next project will be. I can't believe it's been 2 whole years! An absolute joy to see it all done an assembled. Another inspirational restoration that shows what can be done when one perseveres. Nice job. Fun journey. Good learning. Can't ask for anything more out of this hobby. A+. Very nice work. The before and after really drives home how rough a set can be and still be restored to like new. Your making me want to restore my 48-1000. Absolutely phenomenal. I take my hat off to you. Magnificent. Your tv was barely a parts donor and today it's a museum piece! Congratulations on an awesome and (above all), inspiring job. You've accomplished what most of us would not have attempted. Good job. You have my respect! You're lucky to have a 48-1000 with the seldom seen "double-D" style mask. In my opinion the sets looks more appealing with it. The 48-1000 looks better to me with the rectangular mask (the whole thing is straight lines and deco styling so a big circle messes with the overall design), but having what is believed to be the only complete double-D 48-1000 and simply owning a 48-1000 (I had been looking for one for years) outweigh a minor cosmetic gripe. You have a point, but it does make it a more unique 48-1000. 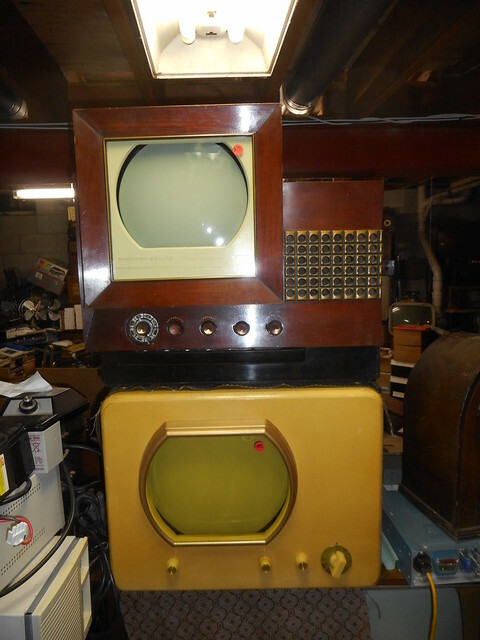 I believe I saw more than one or two of these through all my years of focus on vintage TV. I would imagine it was from the very last run of that model. The double D mask would make it a late production unit. This is the first I've seen one on a 48-1000! You have done a fantastic job with your Philco TV set, and your success is an inspiration to us all. Congratulations!